Posted by Vivian on 26 September 2013; This entry is filed under General. 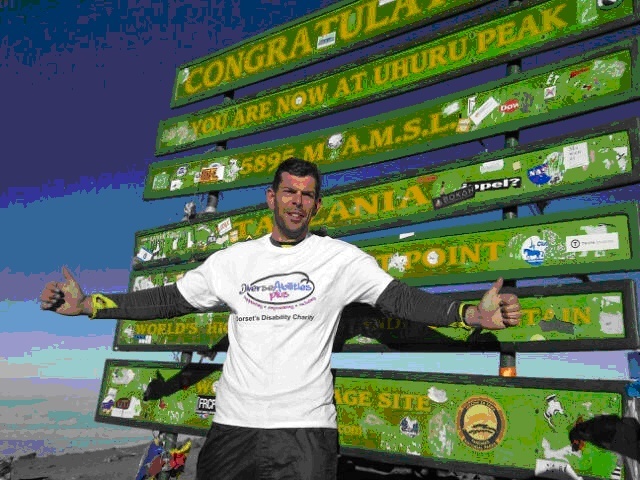 Dormen mentor Gary Knight from Poole has just returned from climbing Mount Kilimanjaro in order to raise money in aid of Diverse Abilities Plus, a Dorset-based charity that provides invaluable support for children and adults with physical disabilities and learning difficulties. Gary, who trained hard over many months for the challenge, said: "Of the 19 of us in the team, 14 managed to make the summit. Three didn't make it to the top on the final night due to exhaustion, one to acute hypothermia and one to temporary blindness brought on by the cold conditions(!). Thankfully everyone in the team has now fully recovered. The ascent took 5.5 days with the final 'push' involving a 7 hour climb in the dark at -25 degrees C climbing the remaining 1,200m from our base camp to reach the peak at 5,895m at 07:30am. I'm back in the UK now, catching up on lost sleep and will never want to see a tent again! That said, a fantastic experience and huge challenge nonetheless." Gary has raised nearly £3,000 for Diverse Abilities Plus through the climb. You can see more of his photos of the climb at www.justgiving.com/Gary-Knight-Trek where you can also make a donation if you would like to help him raise a few more pounds towards his target.